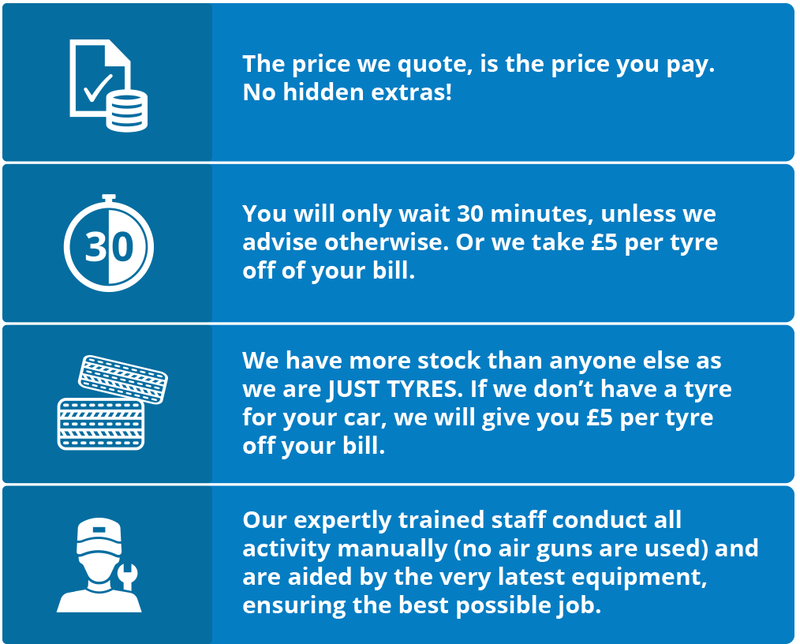 Just Tyres High Wycombe offers huge stock levels of quality car, 4x4 and van tyres. We're always happy to offer an unbiased opinion on our products and brands, helping you get the right tyre for your individual tastes. The tyre fitting centre in High Wycombe is located on Marlborough Trading Estate with great facilities including parking. If you are looking to buy tyres in High Wycombe, please come along and see us, we can offer advice and assistance for all of your tyres needs and also offer a FREE tyre check to ensure that they are in top condition. If you would like to buy your tyres online and have them fitted at our tyre fitting centre in High Wycombe, just click on the Buy Online image and book your fitting day and time during checkout. Our customers' safety is our concern, and each and every one of our installations will include hand tightening, rather than using air guns that can potentially damage the wheel nuts and the thread. This also ensures that we do not over tighten nuts, causing you problems in the event of an emergency. We also make sure that the tyres are correctly seated on the wheel by over inflating the tyre before deflating it to the correct pressure. Our very own comprehensive safety leaflet can be found in our High Wycombe fitting centre while you can also read it through online. It provides expert information on sidewall markings, the law, safety, customer service and how you can get the most out of your tyres.